Top 7 Ways To Save On Produce — #2 Stop the Waste! But How? 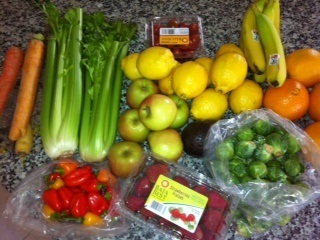 I started out sharing with you my number one way to start savings on produce last week. Read that post and watch the quick video starting us out on my Top 7 Ways To Save On Produce. After you begin to find the produce at a discount price or the best price you want to pay, then what? How else can you save on produce? The next major way is to ensure you do not waste the produce. If your home is like mine used to be, I would by fruit and vegetables but would end up throwing some away for various reasons ~ such as, it got old, wasn’t as flavorful as it looked, forgot it in the back of the fridge and so on. No matter what the reason, ANY cost goes up dramatically when there is waste. My secrets to not wasting produce are — Clean it right away and prepare it to eat. Don’t wait! The minute I get the produce it is washed and prepared to consume or use in recipes. I find it is much easier to quickly prepare the produce to use rather than preparing it day after day after day in small quantities. 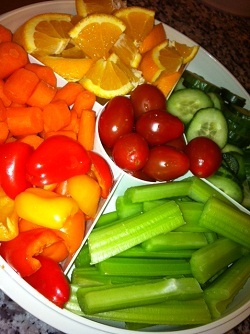 Clean all hard produce — wash, cut and trim celery, carrots, beets etc. I wash everything including citrus and apples because I just can’t get out of my mind all the fingers on it (yuk!) You may even want to wash your bananas, what if there was a big furry spider on it or bitty flies, plus even though we don’t eat the peel what is on the outside that we are holding? Cleaning the produce helps ensure you don’t bring any bugs into the house that can produce and cause you more problems. I do not wash things that perish easily after washing like strawberries or other berries, leaf lettuce and the likes. Trim off bottoms of lettuce or cabbage, broccoli and cauliflower. Just basically clean off enough of the produce to get it as close to use as possible without causing additional waste. I have an onion keeper like this one (Onion Keeper ) and it is fantastic, zero smell in the fridge! At all times, I have a peeled onions (sometimes diced) ready to pop into recipes or on sandwiches. If you have have meals this week to make that will used chopped celery, carrots, onions or whatever consider chopping it all and keeping it ready to use! I pull this out and just set it uncovered on the table about the time I know family is going to start sniffing around for a snack. When the kids are playing video games, reading on the couch or doing a craft project, I uncover this and hand it to them. When dinner is running late and everyone is hungry, this gets pulled out. If I don’t have enough time to prepare much for dinner and it seems thin, I use this tray. Just before bedtime, “I’m hungry” seems to be said and I have the tray ready. When I bring out the tray sometimes I may include ranch dressing, caramel for apples, peanut butter or anything you can think of to add variety to the tray, but we are more inclined to eat it all plain. During the week, I will refill the vegetable tray maybe 4 times! By the end of the week we consume more produce because of it being prepared and cleaned ready to be eaten. It’s all about convenience. #2 – Stop the Waste! But How? #3 – This simple step will save you every time! I am sure you have tips and trick to save on produce. Do share you ideas on ways to save on produce in the comments section. When my vegetables start to get wilty or too many to eat, I make a stir fry. My family thinks it’s the greatest meal which is truly is easy and doesn’t require a lot of time or effort. I also prep vegetable and fruit in single-serving containers on Sunday for a quick grab and go when making lunches.